Are you trans? Do you hear voices or see or experience things others don’t? If so you’re not alone. Being trans and having unusual sensory experiences can be really overwhelming. Here are some questions young people in your position have asked us before. Note: We’re using ‘trans’ here to talk about a range of experiences a person might have whose gender differs from that assigned to them at birth – this can include people who transition medically and those who don’t, men and women, non binary people, gender nonconforming people, and many more. Nope, you’re not. Did you know that around 8% of young people hear voices*? This means in a class of 30 students there might be 2 or 3 who hear voices. There are lots of young (and old) people out there who hear voices. People don’t often talk about these experiences. And we rarely hear about people who are having these experiences and are coping well, even though many people do. Hearing voices might make you feel really overwhelmed, angry, scared or depressed. These feelings might make you want to drink too much, do drugs or harm yourself in other ways. If this sounds like you, there are lots of places where you can get support – see the end of this leaflet for some suggestions. *We’re going to say ‘hearing voices’ to include seeing visions, feeling, smelling and tasting things that others don’t. Only because it’s shorter, not because these experiences are any less important. Why am I hearing voices and has it got anything to do with my gender or my trans experience? 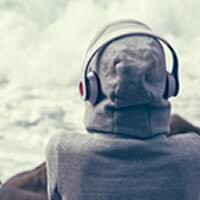 There are lots of reasons why young people hear voices including (but not only) stress, bullying, trauma, drugs (legal and illegal), head injuries, or spiritual reasons. Sometimes it’s just an individual difference, like the fact that some people are left handed. Voices can get worse or more difficult during hard times. We’ve found that often there is a link between how you’re feeling and how nasty your voices are to you. It can be hard coming out as trans when you’re young, especially if people around you are not supportive or treat you badly. This could mean your voices get worse or you hear voices for the first time. If you’re exploring or discovering your gender and you haven’t come out yet or you feel bad about yourself generally, you may find your voices picking up on this and maybe saying transphobic things or generally making you feel worse. It is different for everybody and you may hear voices which have nothing to do with your gender – it may be that they relate more to a different aspect of your experience, or to other things entirely. Why are my voices so critical of my gender or my trans experience? If your voices are being horrible about you being trans, it’s important to remember that you’re not alone and it’s not your fault. Sometimes when society or the people around you are not supportive, the voices may echo things that they say. If you hear voices misgendering you or using the wrong name, this doesn’t mean you are not ‘really’ trans. It may feel as though hearing voices, or the things your voices say, mean you are not ‘trans enough’. Although it can feel this way it can be helpful to remind yourself or ask supportive friends and family to remind you that is not true – your trans experience is yours and it is real and valid. If transition* is something you want and need, then you deserve to be supported in accessing treatment and care as much as any other person. Perhaps you’re not sure what you think – the voices can pick up on this and make your uncertainty worse, especially if you’re under stress. Your voices may have views that are very different from your own but if your voices are really loud and harsh, it might make it hard for you to figure out what you think. It’s also important to remember that we’re living in a world where the existence of many diverse genders and bodies is often not recognised or valued properly, and that can make it difficult to be ourselves. Your voices might also be reflecting this and making things more difficult for you. *There are as many different ways to transition as there are trans people. Medical transition can involve hormone blockers and hormone replacement therapy, different surgeries, or therapies such as speech and language therapy. Some people transition medically in ways that work for them and others don’t, and there is no ‘right’ or wrong way to transition. Is hearing voices a curse? Although hearing voices might feel like a curse or a punishment for being different, it’s not your fault. The good news is there are some practical things you can do to start feeling better. If your voices are really critical and overwhelming it’s good to have a toolbox of strategies to help you get through. Different things work for different people but having some simple calming strategies can be really effective. The LGBT Foundation in Manchester provide a range of services for LGBT people http://lgbt.foundation/. You can call them on 0345 3 30 30 30 for advice, support and information. This page was put together for Voice Collective by Mind in Camden and Action for Trans Health, with input from young people with lived experience.